Would you like an appearance that mimics your natural teeth? A crown is a great solution for someone with significant damage to their teeth, whether from decay, the result of a fracture or from a previously failed restoration. A crown is a porcelain sheath that covers your existing tooth, reinstating it’s original size and shape while strengthening and protecting your tooth. 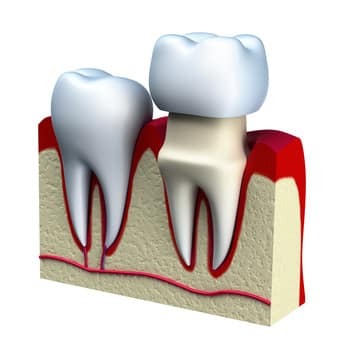 Your tooth anatomy is divided into two distinct parts, the root and the crown. Healthy gums and bones cover the root of the tooth. The visible part of the tooth is the clinical crown. A cemented restoration that partially or completely covers the outside of the clinical crown is a dental crown. A dental crown can restore the function the appearance of of your teeth. Fabricated in dental labs, dental crowns mimic the shape of your original teeth, protect cracked or weakened teeth, repair broken teeth, resurface severely decayed teeth, support dental bridges, and brighten profoundly stained teeth. The most common crown restoration utilizes a metal lining covered with porcelain. This type of restoration is not natural in appearance because light is not able to pass through porcelain metal crowns as it does with a natural tooth. The result is often an opaque or flat-looking tooth and often these types of traditional crowns leave a dark or grey line next to the gumline. Unlike metal or porcelain-fused-to-metal crowns, the all-porcelain crown is a visually ideal repair. Porcelain has the same polish and shine as dental enamel and it responds to thermal changes in a similar fashion – minimizing heat sensitivity or possible thermal cracking of the teeth. Additionally, because porcelain has the same hardness as tooth enamel, the crown will never damage nor will be damaged by your other teeth. To make sure you take advantage of the full and maximum lifespan of your porcelain crown restoration, treat them as you would your original teeth, with good dental hygiene and regular check-ups and cleanings. Crowning teeth is a three-step procedure. 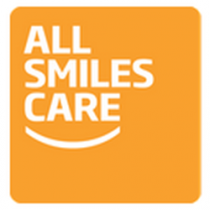 In Westminster, MD, All Smiles Care will schedule you for two visits. Dr. Imm will X-ray your tooth to determine its health. If there is severe decay, root canal therapy may be necessary to make the condition safe for a crown. If your tooth is healthy, Dr. Imm will reshape your tooth to make space for the crown. He makes this process painless by anesthetizing the tooth and surrounding area. After reshaping, All Smiles Care takes impressions of the tooth that needs crowning and of the upper or lower adjacent tooth so the crown does not affect your natural bite. The impressions then go to the dental lab for fabrication of the crown. Dr. Imm will fit you with a temporary crown while the lab prepares your permanent crown. When your the permanent crowns are ready (usually about two weeks), All Smiles Care will schedule your the second visit for the official “coronation” of your tooth. After checking the fit, bite, and appearance of your permanent crown, Dr. Imm will anesthetize your tooth and the surrounding area to cement the new crown permanently in place. After the procedure, it’s important to favor the crowned side of the mouth. Go easy biting and chewing for a few days, and avoid eating hard or sticky substances. 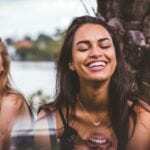 Dr. Gary Imm of All Smiles Care in Westminster MD will give you guidelines to follow so you know when you can resume normal use of your teeth. The life span of the new crown depends on its treatment. With good oral hygiene, regular brushing, flossing, and dental check-ups, and elimination of any bad habits like grinding or clenching the teeth, biting finger nails, or opening packaging with the teeth, permanent crowns are good for fifteen years or more. A dental crown is a the best fix for teeth worn down, cracked, fractured, badly decayed, or discolored by stains. At All Smiles Care, Dr. Gary Imm has the knowledge, skills, abilities, experience, and dedication to patient welfare that make dental crown procedures comfortable, successful, and safe. Why not find out for yourself and schedule a consultation.